Interestingly, @Victor, I tried this one on many occasions, be it in bars, at home alone by myself or during a tasting, and it never stroke a chord with me. I do remember that I always liked the nose but that the palate invariably failed to deliver on the expectations raised during the nosing session. Be that as it may, the Taketsuru 17yo is now sold out in Japan (as the owner of my favourite bar in Kobe told me back in December), so those of us who are keen to stock up on this while retailers' stocks last abroad should better do so. @Victor I am glad you like it. I missed your review when you wrote it. This one is special for me because it changes every time I have it. There are days when I have more smoke, the morning when I have more sherry (and alcohol)and the best day when I have both with some wonderful and fruity malt. The strangest part is that when I let my bottle rest for a few months, the first dram is very closed but in the following days you get the best of it. Thanks for another good review. This one is courtesy of @paddockjudge, who always saves me samples of things I can’t get myself but would love to try. I haven’t tried too many Japanese whiskies before. Other than one a sip or two of the Yamasaki 18 everyone was gushing about (It pays to be polite - or at least appear so - in line at Spirit of Toronto) and it’s 10 YO sibling in 2011, that might be it. So I was excited to give this one a go. With a few drops of water and 10 minutes - green apple, honey. With the water, the flavours are washed out. It becomes bitter. With time and perseverance some of the fruits are back. Definitely better neat. At cask strength or even possibly at 46% this could be a 94/100 whisky. There is nothing really wrong with it. It’s clean, fruity, but slightly underpowered. I would definitely accept this if offered. And possibly buy a bottle if the opportunity arose at a fair price. Had a glass of this last weekend and was not all that impressed. I did not see the level in the bottle, as I drank on the bluffs outside. Perhaps it was a bit over the hill in terms of oxidation. I could not resist trying the T17 since it will become quite expensive next time round. And, of course, the aged Nikka's are going bye bye. I liked the Mikyagikyo 12 more than the T17. Cheers and thanks for the great review. Well written and informative to be sure. Nose: Raisins, dates, sherry, maple syrup, dark honey, seared oak, banana-nut, buttered bran muffins, marmalade, ginseng root, and some mild herbal notes. Palate: Beautiful, silky texture with a paced arrival. I get Raisin Bran cereal, banana-nut, soft spices, herbal notes, oak, ginseng, rich caramel, and some fruit-forward sherry fruitiness. Finish: The spices build to a not-too-heavy but thoroughly enjoyable crescendo. A light, silky caramel presence sets in, and blankets the other notes of banana-nut, seared honey, Japanese oak, damp earth, soy sauce, herbal notes, and gentle smoke. Medium length and very enjoyable. This whisky treads the difficult line of being great for connoisseurs and novices alike. It’s beautifully complex but also extremely approachable. The balance and structure are near-perfection, with all the notes sounding off in total harmony. Truly, nothing about the Taketsuru 17 is off-key. However, one could be justified in complaining about the low-ish abv. As MaltActivist mentioned in his review, this whisky would absolutely soar at cask strength. While it does offer a healthy kick given its 43%, I think a significantly higher abv might elevate it to being nothing short of magnificent. But as it stands, this is still one of the finest non-single malt experiences to be had out there. Extremely recommended. 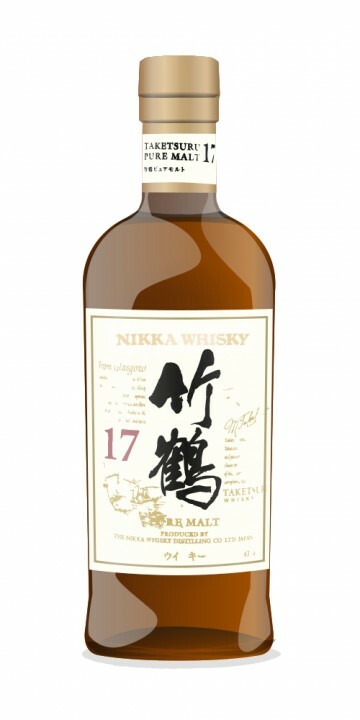 Nikka Taketsuru 17 yo is truly a gorgeous whisky, though I don't know why the category of "blended malt" should seem so very far away from "single malt" as a flavour style. It is still all barley-malt whisky. Now if this Connosr crowd ever brings back onto the 50 top highest rated list true blended whisky based on barley-malt, whether from Scotland or elsewhere, that will be radical. At one time The Bailie Nicol Jarvie blended Scotch was on the Connosr top 50 rated list. I am not holding my breath about a blended barley-based whisky coming back onto that list anytime soon. @hunggar great review as usual. We both seem to have found very similar flavors and looks like we gave it basically the same score. Lovely blend this and I agree with @Victor that blended malt should not be so very far away from single malts given it's basically all barley-malt whisky. He went back to Japan armed with whisky making knowledge and a Scottish wife (of no relevance to this review by the way) and began work at Kotobukiya (which would later become Suntory). Then in 1934 he decided to open up his own distillery and chose Yoichi on the northern Japanese island of Hokkaid?. He believed that this part of the country most resembled Scotland. This is quite a bold whisky and unashamed of it's flavors. I'd love to see a cask strength version of this. Freaking yum. This is on my most wanted list. Need to get some now before the price goes up a la Yamazaki 18. I am super impressed with several Japanese malts. I wish more were available in the US. Yes! This whisky drinks pretty big for its abv, but a CS version of this would be EPIC! Strange, I've seen reviews here that have the abv at 40% and yours is at 46%. The only ones I've ever had are at 43%. Regional differences? Taketsuru 17 yo is a blend using malt whiskies matured in Sherry casks for seventeen years or more from both the Miyagikyo and Yoichi distilleries. The term “Pure Malt” indicates that the whisky does not contain any grain whisky. It is named in honour of Masataka Taketsuru, the founder of Nikka, one of the two major Japanese whisky-producing companies. The nose is quite fruity with honey, vanilla, lemon and banana. At the end there is a touch of smoke, unexpected but welcome. All in all this is a very pleasant nose. The palate is medium-bodied, smooth and very fruity, too. I detected banana, grapes and caramel, followed by subdued smoke and some pepper. The finish is medium-long, fruity, dry, and both spicy and peppery at the end. I liked this very much. It is quite a step from the 12yo that had struck me as being a bit bland (although very drinkable). Taketsuru 17yo has got the complexity that I would expect from a blend and I was particularly impressed with its balance and the really nice nose. Quietly sip this on an evening and you cannot go wrong. At risk of being considered heterodox, I have a pronounced preference for Japanese whiskies over their Scottish cousins. I admit this here not merely to disqualify myself from reviewing non-American whiskies, but to state my bias openly. The Japanese have a genius for imitation that transcends the derivative into a mystical realm of inspired mimesis. Their distillers have somehow managed to take the traditions of Scotland and create something that, to my virginal Scotch palate, out-Scotches Scotch. I would go so far as to opine they have devised a way to access the original platonic idea of whisky and approximate it for our mortal senses. The grand body, the immense and wafting smoke of Scotch meets a delicacy and precision that effortlessly distills the pride of Japan’s awe-inspiring civilization into a single bottle. And that bottle is the Nikka “Taketsuru” 17 year pure malt. Pure alchemy, rather. How can anyone extract from a foul of grainy sludge such a supernal draught? You might as well make an earth out of an accretion disc from around the moon. The Taketsuru is a light amber and has a thick nose that presents strata of char and smoke. Native Americans could have used this for their smoke signals as its deliciously reeking nose can be smelled from miles away. Amid these wafting surges is a tantalizing whiff of something sweet and seductive, like the sweetness of a good cigar. Fine consistency with some heat but the nice sort of heat that a curry furnishes. Where to begin with flavors? Smoke, smoked meat, blueberries, malt, and a bit of charred leather, grilled eggplant, and apricots. Rosewater and pepper emerge in subsequent sips. This is a beastly whisky. "Multeity in unity" like Coleridge's beauty. Wonderful and passionate review! I'm reading it as I'm targeting this bottle for Xmas present to my self. But I have not had the previlge to taste it yet. I've had the 12 and 21yo Taketsurus and they are both champions in my book ("best taste:price ratio" and "best non-single malt" respectively. I just have a feeling it is safe to buy the 17yo without having tasted it first. Your review reflects what I expect from from this whisky. Thanks, NilsG. The 12 and 21 are fantastic but this titan remains my favorite of the three. The extra age in comparison to the 12 allows the 17 to develop its flavor profile to an intense and yet lovely balance (like a good curry). The 21, for me, has a few protruding elements that had been magically blended into an organic whole in the 17. That said, I have only had the 21 once and it deserves another chance or perhaps three or four chances...how I love the Japanese! That has to be one of the best whisky reviews I've ever had the pleasure to read. About 6 months ago someone asked if I was interested in a bottle of whisky they had opened and used for cooking. Being the whisky nut that I am, I of course said 'yes please'. Turned out to be a bottle of Taketsuru 17. I thought to myself 'Mottainai' which roughly translates as, what a waste. Many thanks for the kind words @nikkaman. And also for the great anecdote! Mottainai indeed!! While I've encountered Nikka on a few occasions, I've yet to sample any of the blended malt they call "Taketsuru", so I had to make it one to try at the Nikka stand. I suspect this will get very popular over the next year; the 21-year version just won world's best blended malt a week previously. The Taketsuru is, to my mind, decidedly Japanese, and brings back rain-infused forests on hillsides enveloped by the sea. The nose gave me grassy tones, with light wood polish, and hints of esters reminding me of the grain whisky (that I'd had a few moments before, admittedly). On sipping, this was overtaken by more grungey flavours - red wine, grapes, salt and pepper, and a fair bit of burn. A pleasantly hot day after emerging from the top of the woods. Hitting the throat, the real forest notes comes out - that lovely vegetal line, delivered in a business-like manner. This gradually resolves into the damp forest floor, a hint of winter flowers, and some sweat. There's a certain "complex simplicity" to the Taketsuru 17. There range of flavours are delicate, balanced, and reveal themselves in proper order, adding up to a hugely interesting and very enjoyable whisky indeed. Nice review. Sounds very interesting.